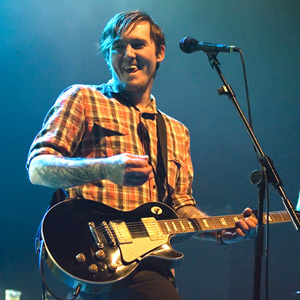 The Gaslight Anthem frontman Brian Fallon has declared war on former The Smiths stars Morrissey and Johnny Marr by making a cheeky reference to the singer's sexuality and accusing the guitarist of dressing like a child. The rocker hit out at Morrissey's notorious shirt-stripping stage antics and his fondness for flowers, before aiming a sly swipe at his notoriously ambiguous sexuality. He then turned his attentions to Marr, mocking his youthful attire and suggesting the songwriter needs to grow up. In an interview posted online, Fallon says, "I listened to The Smiths, you know, but there's too much tape on the body and too much 'shirts off' and roses in the teeth, you know? It kinda (sic) wasn't my thing. "I get it. Hey, he's (Morrissey) got nice hair, he's got a cool voice, I guess he gets the chicks - but he doesn't care does he? He says he doesn't like boys or girls. What do you like? TV? Red Bull (energy drink)?" Asked for his opinion on Morrissey's former bandmate Marr, he adds, "Did you hear what he said recently? He said he will get The Smiths back together when the British government surrenders control. I was like, 'You're a crazy person! And you dress like a kid, man. You're not young. No more!'"